Turn heads on stage and off with our wonderful blush. This gorgeous rose-gold shade gives your face the soft-sheen and glowing look of a girl — or a girl-at-heart — who's been kicking her heels. Do you rock or do you rhumba? Whatever your age and whatever your sound, this is your blush! Ingredients: Synthetic Fluorphlogopite, Mica, Cetearyl Ethylhexanoate, HDI/Trimethylol Hexyllactone Crosspolymer , Glycerin, Dicalcium Phosphate, Squalane, Octyldodecyl Stearoyl Stearate, Parfum (Fragrance), Caprylyl Glycol, Ethylhexylglycerin, Polysorbate 80, Limonene, 1,2-Hexanediol, Linalool, Hexyl Cinnamal, PTFE, Dimethicone, Benzyl Salicylate , Pentaerythrityl Tetra-Di-T-Butyl Hydroxyhydrocinnamate, Chondrus Crispus (Carrageenan), Xanthan Gum, Zinc Stearate, Silica, Lauroyl Lysine, Cetearyl Alcohol, Citral, Butylphenyl Methylpropional, Citronellol, Eugenol, Cinnamyl Alcohol, Geraniol, Tocopherol, Bht. [+/-: CI 15850 (Red 6, Red 7, Red 7 Lake), CI 15985 (Yellow 6, Yellow 6 Lake), CI 19140 (Yellow 5, Yellow 5 Lake), CI 42090 (Blue 1 Lake), CI 45410 (Red 27, Red 27 Lake, Red 28 Lake), CI 73360 (Red 30, Red 30 Lake), CI 77007 (Ultramarines), CI 77163 (Bismuth Oxychloride), CI 77288 (Chromium Oxide Greens), CI 77289 (Chromium Hydroxide Green), CI 77491, CI 77492, CI 77499 (Iron Oxides), CI 77510 (Ferric Ferrocyanide, Ferric Ammonium Ferrocyanide), CI 77742 (Manganese Violet), CI 77891 (Titanium Dioxide)]. 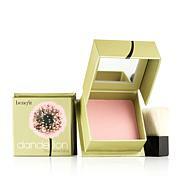 Love this product, blush is perfect for every skin tone. Smells good to also. This has become my favorite blush and the only one I use. The color is so perfect. It is never overwhelming like some colors, just perfect. 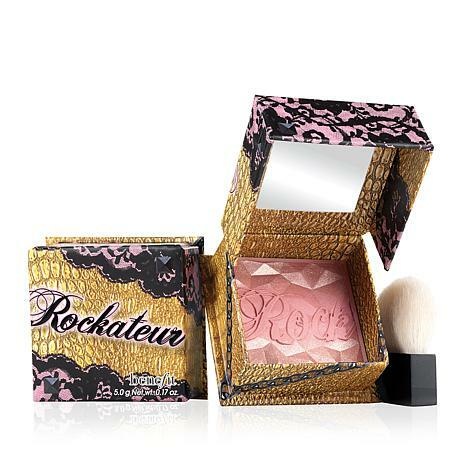 I had wanted to buy Benefit Rockateur for a while so when I saw it on HSN decided to get it.It's a beautiful rose gold blush/glow.When I use it, that's all I use and make it as light or as dark I want it to be, then blend it. It's a good product. I absolutely love this blush! It not only looks good on, it smells fantastic! I love the color and the blend-ability of the blush it is soft but has a nice glow. Just as described. will buy again.